The necessity to curb the despotic tendencies of human nature and ensure good governance is the core of doctrine of Separation of Powers. Indeed, a major ingredient of democracy is the institutional compartmentalisation of governmental powers in such a way as to ensure that the same group of people or institution is not saddled with the responsibilities of law-making, law execution and law interpretation. This implies that there should be three separate organs/arms of government with their separate sets of functions and powers in a democratic system. Thus, the need to limit the powers of each of the various organs of government is at the centre of constitutional democracy using the instrumentality of compartmentalization of governmental powers (Omotoso and Oladeji 2015). To be sure, government performs its role of effective governance by dividing its powers and functions between distinct institutions and personnel, with each performing some specific but interrelated and sometimes overlapping functions (Edosa and Azelama 1995, italics added). Aguda, O. (2012). 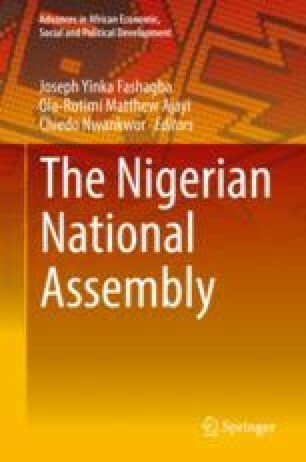 “National Assembly’s Oversight Functions and Fair Hearing”, The Nation Newspaper, March 21, p.2 (http://www.thenationonlineng.net/2011/index/php/politics/48492-national-assembly.html (Accessed 21/05/2016). Kadir, A.A. (n.d.). “Legislative Oversight Failure, Catalyst for Corruption”, (http://www.gamji.com/article8000/NEWS8636.htm) (Accessed 21/05/2016). Onyekpere, E. (2012). “Opinion: Legislative Oversight and the Budget”, (http:omojuwa.com/2012/11/opinion-legislative-oversight-and-the-budget) (Accessed 21/05/16).